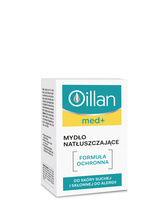 Oillan is a care programme for skin affected by skin disorders (adjunct to pharmacotherapy) - AD, psoriasis, eczema and ichthyosis. It supports regeneration of the skin and limits transepidermal water loss (TEWL) and additionally lubricates, moisturises and smoothes the epidermis. The products have been dermatologically and allergologically tested under the supervision of clinicians.